I can’t let April go by without thinking of Mom and Dad. 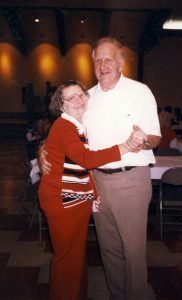 Dad’s birthday was April 10th and Mom’s April 19th–Bob’s Dad’s birthday was April 13 and my Aunt Leona’s was April 1. When I was a kid April was the best month for eating cake and celebrating. Though all four are gone now I can’t help but think of them. This year I will continue to celebrate their lives, remembering the good times. Dad loved playing music. He had guitars, harmonicas, and accordions. In warm weather, he’d build a campfire and we’d sing old songs in the front yard. Mom wasn’t musical, but she’d sing, too. One of their favorite songs was Let me call you Sweetheart. They also liked the Tennessee Waltz. I don’t think I can hear either of those songs without thinking of my parents. Happy Birthday, Dad and Mom. Your memory still lives on.